With real concrete and concrete-look materials being so big last year, we thought it the perfect time to discuss the ‘real vs synthetic’ options as the ‘trend’ looks set to stay for 2018 and beyond. We mix our own concrete with a blend of sand, aggregate and water. It’s an engineering process in itself to get the mix right as benchtops are so structurally different to other concrete designs such as floors, and aesthetics need to be factored in too. Josh and Elyse had a very clear vision for specifying real concrete on The Block (Series 13), and you could see that the process was an art in itself. With the show’s time constraints, they were hard pushed for the concrete to cure in time. But they made it happen! The result was a raw, pure, chunky concrete fire hearth which ran seamlessly to their winning outdoor retreat. It was great to see the whole process being shown on The Block as it is not an easy one. Many people believe they can pop to their local hardware store, buy the raw materials, and make their own. 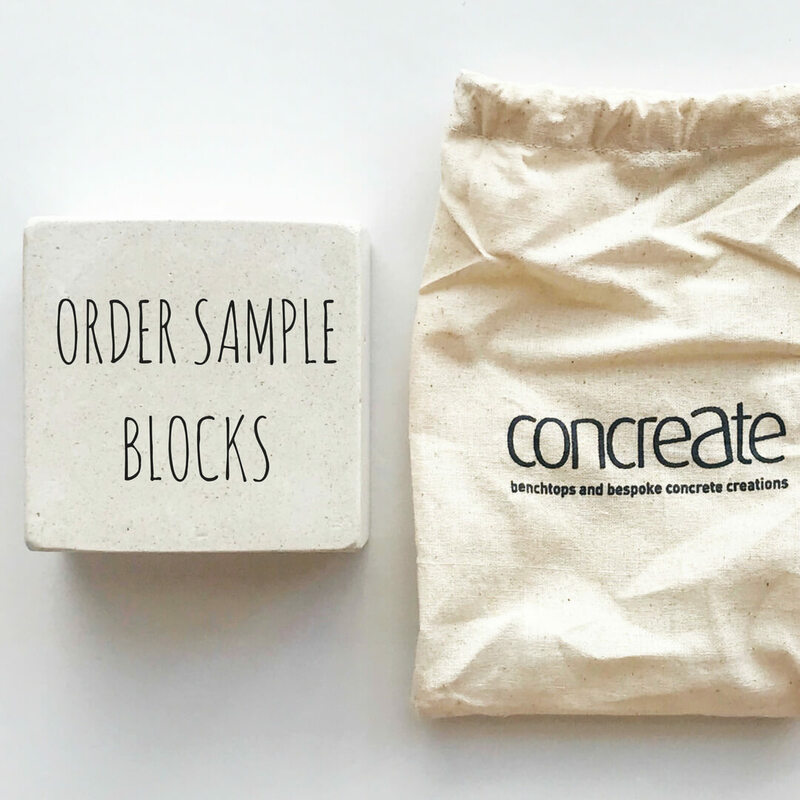 Having personally tried to craft concrete myself, I was ready to throw the towel in after 10 minutes! Even mixing the cement and aggregate with the water in the wheelbarrow was a tough job, and then to pour into the molds, level, level again… well I simply did not have the skill set and the end result was a slab full of air bubbles and could not be used. Duane has been on many courses and spent years perfecting his technique, so that our Concreate benchtops and concrete products are perfect – well, perfectly imperfect, because that is concrete’s appeal… The 'raw luxury’, the integration of organic, earthy, authentic materials. Elsewhere on The Block, we saw the introduction of concrete-look materials during kitchen week with engineered stone benchtops. Engineered stone is made up of aggregates (usually quartz) bound together with epoxy and polyester resins, as well as chemicals for UV absorption, stabilisers and hydrogen peroxide to help cure. With synthetic concrete, part of the appeal is with the thinner profile which is difficult to achieve with real concrete due to the steel reinforcement. The thinnest we do is 50mm. But the sleek look forgoes the feel of real concrete. Whilst we can see the appeal for both, we prefer the handcrafted process as it’s kinder to the environment and embraces the slow business movement which so very much aligns with Concreate’s philosophy. In fact, we had a chat with an architect the other day who was specifically seeking real concrete because they want to stay away from mass produced synthetics. Outside of The Block, where there are no time constraints, why wouldn’t you?! Hi, we are currently doing a kitchen makeover and are in Miranda, Southern Sydney. We want our hero piece to be a 3.3 metre concrete bench, approximately 1100 wide. Given our location is there a way we can see your work, possibly a Friday? Hi Darren, thanks for getting in touch. I have passed your query on to the sales team and they will get back to you to organise. We have a workshop in Botany not too far from you and most happy to organise a time that suits.